Beans are naturally low in calories and high in fiber. They are important if you are trying to lose weight because they increase fullness and satiety without adding a lot of calories. Beans are a great source of plant protein. A 1/2 cup serving of cooked beans contains 7-8 grams of protein. This is the same amount of protein in 1 oz of cooked chicken. 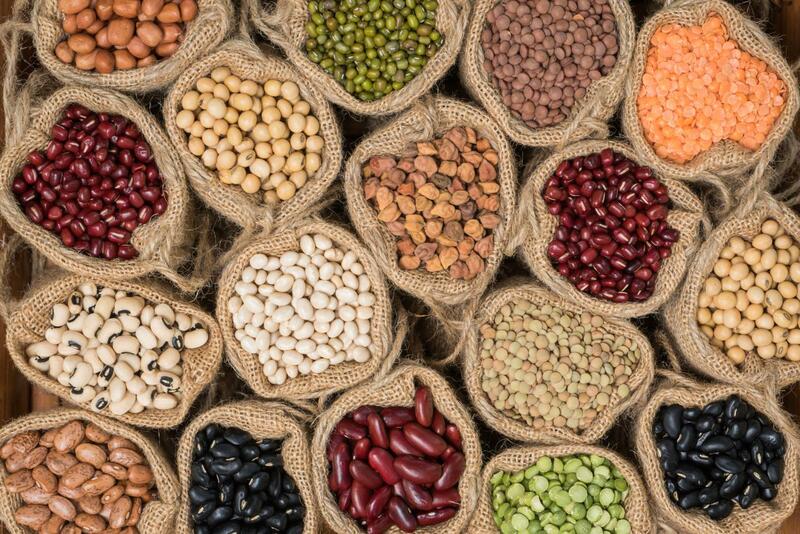 Beans win the award for the least expensive protein-rich food out there, especially when compared with meat. Beans are naturally gluten free. They are versatile and can be used in soups, dips, salads and made into flours for baking. Preheat oven to 400 degrees. Drain and rinse chickpeas then place in a medium sized bowl. Mix in olive oil to coat chickpeas. Next measure out spices and sprinkle on chickpeas. Mix to ensure an even coating. Transfer to baking sheet and bake for 15 minutes. Stir chickpeas. Bake another 15 minutes, stir chickpeas. Finally, bake another 10 minutes or until peas are crispy. Serve hot or cold. Preheat oven to 350 degrees. Lay corn tortillas out on a baking sheet, then coat both sides of each tortilla with non stick cooking spray. Bake for 6 minutes, then turn over each tortilla. Bake another 5 minutes or until golden brown. While corn tortillas are baking, heat 1 cup of black beans in a small skillet with cumin, garlic powder. Top each baked tortilla evenly with beans, lettuce, salsa, avocado and green onions. This is a tasty meal, though very messy. Make sure you have extra napkins handy. Enjoy! Nutrition Information (serving size = 2 tostadas): 347 calories, 10g total fat, 53g total carb, 15g dietary fiber, 12g protein, 123 mg sodium. These recipes are entered and analyzed in MyNetDiary so you don't need to enter them from scratch. Instead, you can copy and edit the recipe easily by logging into MyNetDiary via the web program. Next, go to Community, and then search "Dietician" with "People" chosen in the drop down box. Click on "Dietician" link. Scroll down Dietician Personal Page and find Custom Catalog. Find the recipe. The recipes in blog are listed as: Roasted Chickpea Appetizer MND Dietician and Quick and Easy Black Bean Tostadas MND Dietician. Copy recipe by clicking "copy" link on the right side of the screen. Once you do that, you can use a recipe in your own food log without having to enter it yourself. This recipe is also found in Dietitian account - so you can copy from either account. Foods & Recipes/"Beans, Peas, & Soy"